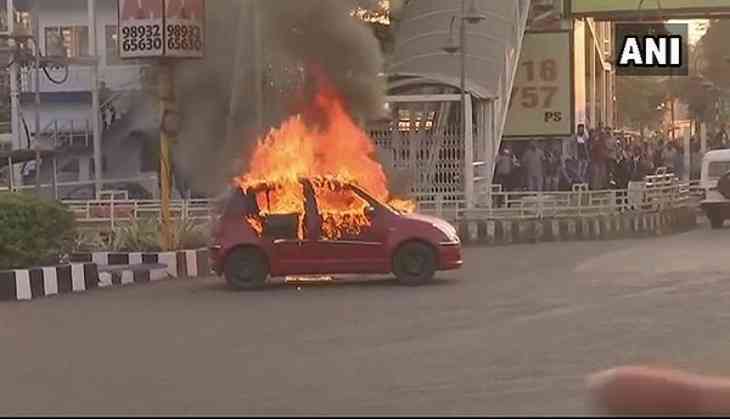 Two people have been taken into custody after creating a ruckus and burning vehicles in protest against the film 'Padmaavat' in Bhopal. With Sanjay Leela Bhansali's film 'Padmaavat' release, protests led by Rajput communities and other fringe outfits took a violent form in various parts of the country, yesterday. The protestors also pelted stones at the PVS mall in Uttar Pradesh's Meerut allegedly in protest against the film. At least 15 people were arrested in connection with the violent protest against the release of the film in Maharashtra's Pune as well. In some states, including Uttar Pradesh, Telangana, Gujarat, and Haryana, the members of Karni Sena have resorted to burning posters and vandalizing the ticket counter of the movie theaters. The apex court had earlier set aside the notification passed by the states of Madhya Pradesh, Haryana, Rajasthan, and Gujarat to ban its release. The epic drama, based on 16th-century Sufi poet Malik Muhammad Jayasi's epic poem 'Padmavat', released today.